A salad of roasted beets couldn’t be simpler or healthier. Serve the beets and goat cheese on top of greens, or just by themselves. 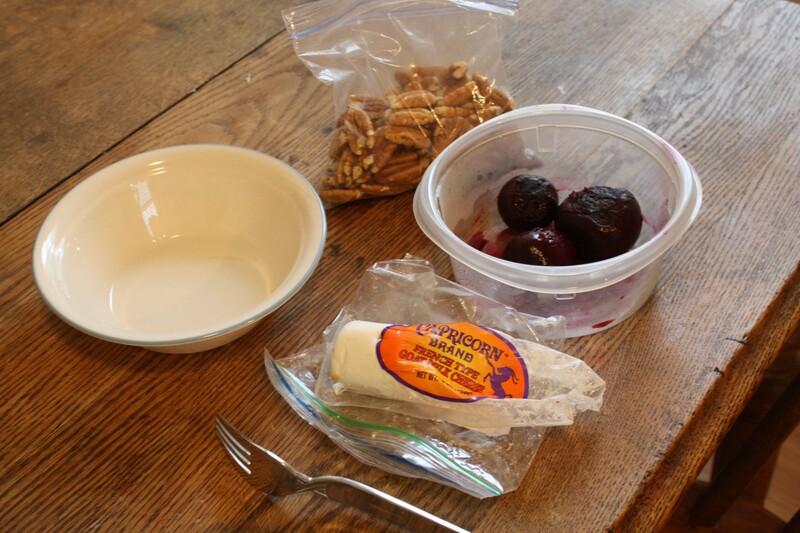 Roast the beets beforehand, and you’ll be able to prep your lunch in minutes. Too often, I plan to do too much during my lunch break. I should probably only be gone about half an hour, but usually that half-hour turns into one hour-oh-I-need-to-go-back-to-work! By the time I walk to my house, make up my standard veggie quesadilla or omelet, water my garden, read the rest of the paper, empty the dishwasher—then I don’t know where the time has gone. I’m lucky that I only live a few blocks away! Last week, I realized I needed to make something for our New York-themed potluck at work. Pizza is easy, cheap and very “New York,” so I figured I could crank two pies out pretty fast. Before work, I mixed up some dough in my food processor with this recipe, and let it rise a few hours. 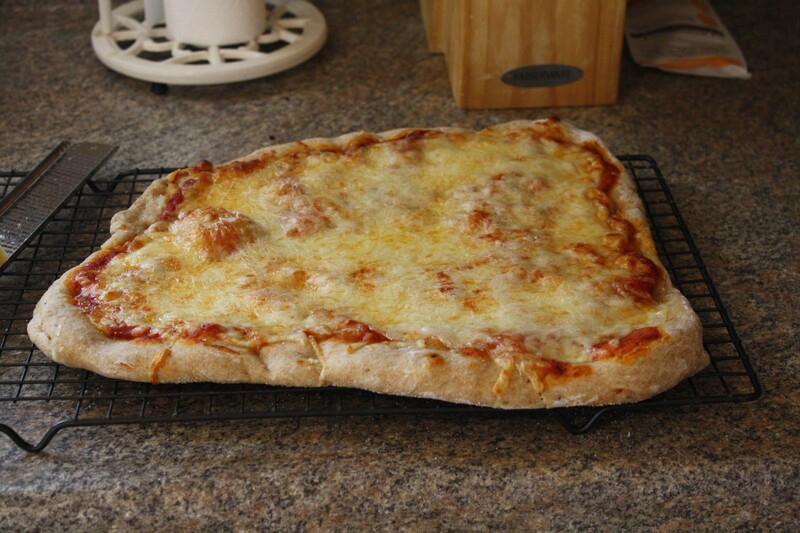 At lunch, I would just roll the dough into two circles, top with jarred tomato sauce and mozzarella cheese, and throw them in the oven. But of course my oven took forever to preheat, and then the pizzas didn’t want to cook, and I burned my arm, and I still had to make something for lunch for myself because the potluck wasn’t for another five hours and I couldn’t go without eating that long. Phew. The pizza of course took a little longer than I anticipated, but I made it back to work within a reasonable amount of time. Fortunately, it helped that I had all the makings for a simple roasted beet and goat cheese salad. It couldn’t be easier, and I’ve been eating it the last few days for lunch, as beets are plentiful at the farmers market right now. For about $2, you can get a nice bunch of beets, enough to make at least 2-3 meals. If you roast them ahead of time and just have them sitting in the fridge, lunch will be even easier, and you can pack the salad to go. They may not look like candy, but they sure taste like it! The sugars concentrate when roasted. Roasted beets are like candy. They’re sweet and soft and brightly colored. But yet, they’re extremely healthy for you. Just be sure to keep the beets away from anything that you don’t want to get accidental purple spots. I’ve been wearing an apron whenever I mess with them. They’re dangerous! 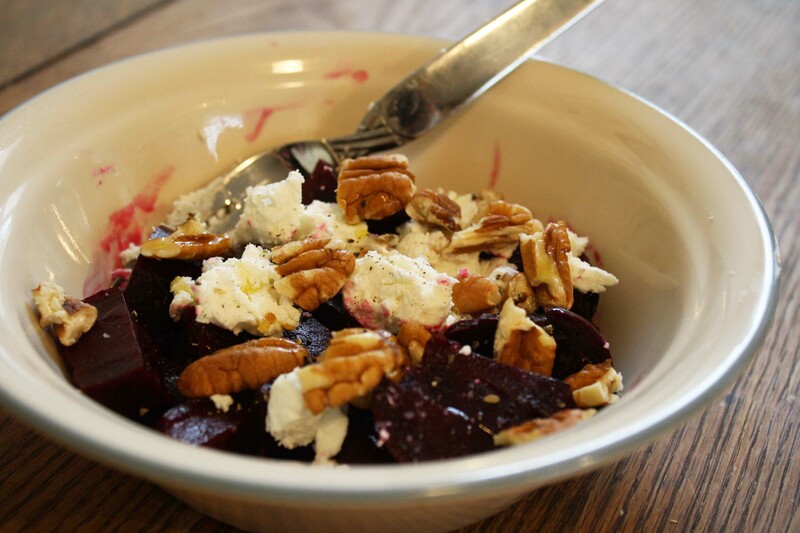 But mixed with tangy goat cheese, earthy and crunchy nuts, and just a tad of oil, beets can be a perfect, light meal. 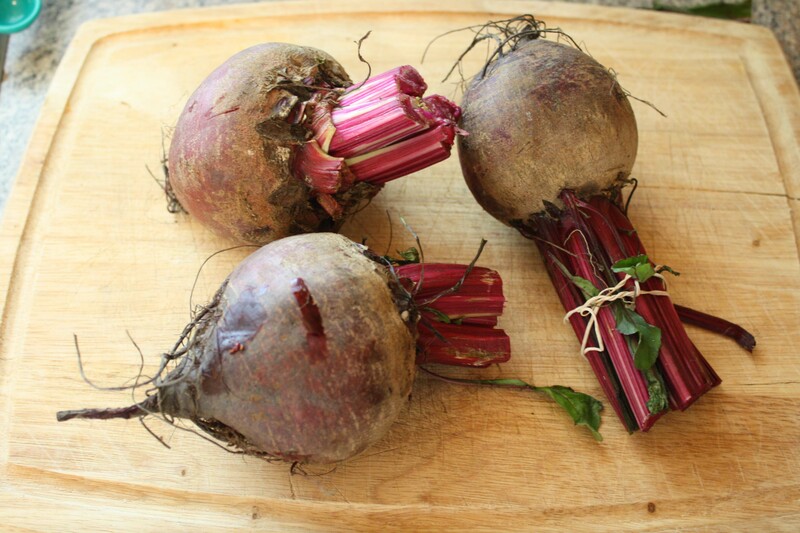 To roast: Cut the tops and stems off, and wash the beets. Place the beets on a piece of foil, and wrap them all together. Stick them in the oven for 45 minutes to 1 hour, at about 375 degrees. The time and temperature could vary, depending on the size of the beets. To see if they’re done, stick a fork or knife in the beets, and if they are soft and the utensil easily slides in, then they’re done. After they’re cool enough to handle, the peels will just come right off. Be sure to wash your hands well when you’re done! Slice the roasted beets (1-3, depending on their size and how hungry you are) into cubes. Add a good scoop of goat cheese, crumbled. Top with a few toasted nuts that you’ve broken into bite-sized pieces. I have pecans on hand right now, but walnuts or almonds would also be great. Enjoy! This would be great on top of some salad greens as well, if you have those on hand. Serve alongside a nice baguette or whole wheat roll.